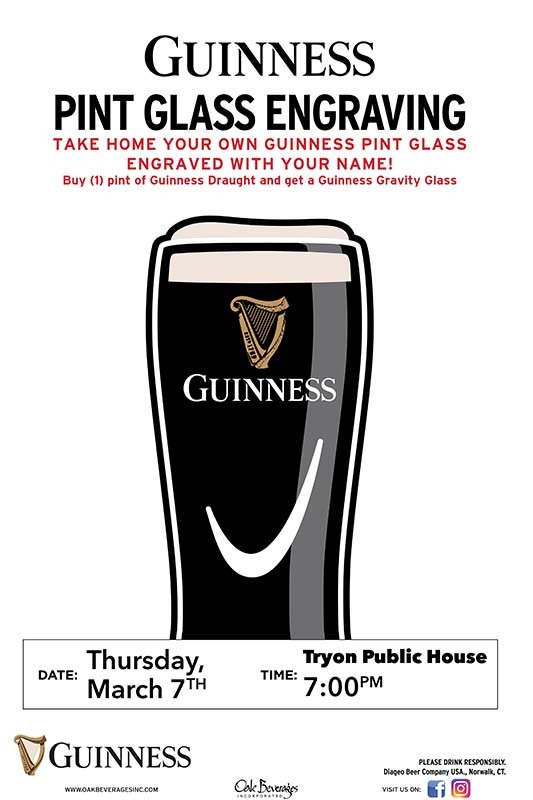 Tryon Public House Guinness Glass Engraving - Oak Beverages Inc.
Tryon Public House Guinness Glass Engraving, Thursday, March 7th, 7pm. Enjoy the warm company of family and friends as you indulge in a cold, refreshing craft beer or one of our signature cocktails. Our rotating taps mean that you’ll always find something new and refreshing. Tryon Public House presents an industrial decor with a laid-back neighborhood vibe. Located directly across from Fort Tryon Park, Tryon Public House serves a daily dinner menu, late night bar menu and a delectable weekend brunch. Whether you’re looking for a romantic evening or a casual place to grab a drink with friends, Tryon Public House is the place to be.